The conference "Galaxy Evolution: Emerging Insights and Future Challenges" was sponsored by the McDonald Observatory and Department of Astronomy Board of Visitors Excellence Funds. It brought together leading observers and theorists from thirty-three institutions and eleven countries to assess recent progress on galaxy evolution, evaluate long-standing paradigms, and brainstorm on possible solutions to outstanding challenges. 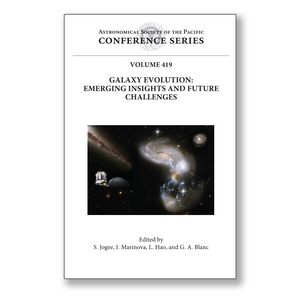 The great strides made on both observational and theoretical fronts in charting the merger, star formation, and assembly history of galaxies are reviewed in this volume. What is the current status of attempts to resolve long-standing challenges to the ?-cold dark matter model of galaxy evolution, such as the angular momentum problem, the problem of bulgeless galaxies, the sub-structure problem, and the cusp-core controversy? What are the implications of the surprising new results emerging on the assembly of disks, bulges, and ellipticals over the last twelve billion years? What are the relative roles of major mergers, minor mergers, smooth accretion, and secular processes in the assembly of massive galaxies? What is the impact of feedback from star formation and active galactic nuclei on galaxy evolution? What observational constraints are needed by theorists, and what theoretical guidance is needed by observers, in order to tackle the next cosmic frontiers? These questions were discussed in the conference, and the results are summarized in this proceedings volume.